Welcome to the 21th edition of the Pyro News. I'm back in the saddle after an extended break from writing the newsletter. Truth be told I put too many irons in the fire...no pun intended...and burnt myself out...pun intended. Well...more so I lost my 'drive' so I took some time off to see what pyrographical direction I wanted to go next. To burn more pictures? To explore other pyrographical areas? To focus on pyrographical education? I could keep pushing the realism boundaries but to what end? Because of the fading issue that many of you know about, I'm always nervous about taking so much time to get the light tones right only for them to change over time. And besides, there are some amazing realism burners out there now...the quality has become outstanding! What I've always enjoyed about burning is to push the boundaries. I'm one of those people who loves the challenge of mastering something. Once mastered I push further in other directions to see what possibilities there are. That's the fun for me. Once I've opened the lock I'm more than happy to share with others how I did it. And that's the other gift for me...I'm a half decent writer and a half decent video maker. (Not my earlier video efforts, but my newer work is getting there.) I enjoy the process of breaking down the technique and teaching others....of getting them excited to have a go. So I've decided that, for now, teaching will be my primary focus in the pyrographic world. And there is a lot to teach! 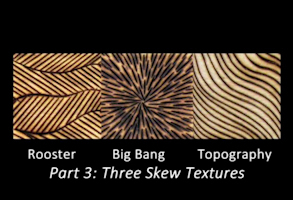 Pyrography is a rare medium....it can be applied to a myriad of subjects, materials, surfaces and applications. It's so vast! It's one of the few mediums that can be seen AND felt. It's time to rub my hands together and have some fun again. It's time to play and pass along....but this time in smaller bites than before. So I can stay motivated and excited and regularly offer you something. Part of my mad experiments. 'Burning Carpet'. This was a plain turned platter when I started. The carpet, fringe, floor and stamps were all textured and carved by burning. I have yet to paint the stamps yet. Soon, I hope. Skink on Ironbark. They bark is entirely burnt. 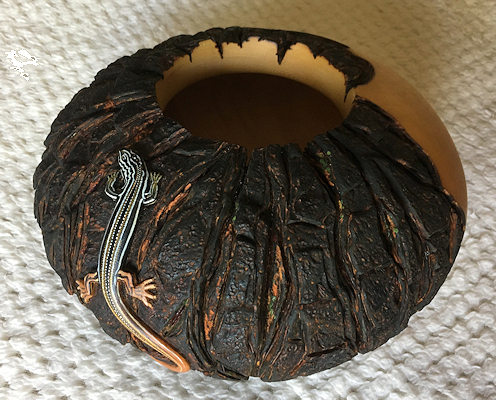 The skink was relief carved out of the huon pine bowl with a pyrography skew and painted with acrylic paint. Now, the word 'free' can be a bit misleading in one respect here: I have to make a little money along the way so I have decided to put ads at the start of each video. The ads I have chosen are the ones where you can 'skip the ad in 5, 4, 3, 2, 1,' seconds. I had been advised to put an ad in front that makes you watch it all the way through, but frankly, if I can't watch them all the way through, how can I expect you to? So please watch the ad as long as you can or, if you can't wait, hover over the countdown until you can close the commercial. The only time I can envisage using the mandatory ad is if I produce a special longer video...one that will only be seen on YouTube. Something like a longer tutorial on shading. Anyway...how much do these ads make me? I didn't put ads on my videos at first...but I've just gotten my 3rd $100 payment and I am well over 400.000 views. 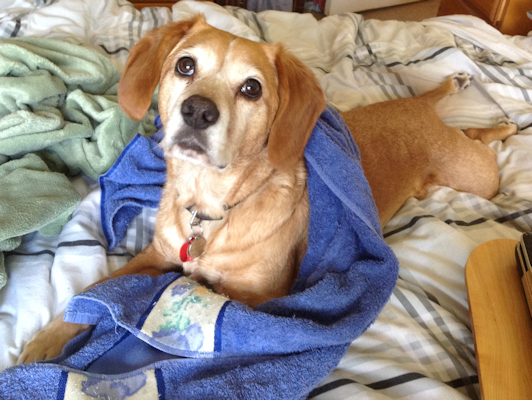 It's really very little, but...it all helps and it pays for Lil's doggie biscuits. P.S. And if you would like to unsubscribe please reply with 'Unsubscribe' in the subject line. P.P.S...sorry, one more thing! My pyro_news email had a glitch and I lost a few months of sign up emails. If you didn't get the email notification for this newsletter please contact me again at the Pyro News Email. I continue to manually post the email notification about the news but I soon hope to cross over to a more automated mail service. More news about that soon. To see 'Basket Weave' click here. To see 'Moon Over Water' click here. To see 'Big Bang, Rooster and Topography' click here. To see 'Tread, Flicker, Burst' click here. ONE COPY OF THE PYRO NEWS CAN BE PRINTED PER SUBSCRIBER FOR PERSONAL REFERENCE ONLY. NO PART OF THIS NEWSLETTER CAN BE REPRODUCED FOR DISTRIBUTION WITHOUT THE WRITTEN PERMISSION OF SUE WALTERS. COPYRIGHT ©SUE WALTERS 2017 To avoid the Pyro News notification being blocked, be sure to add pyro_news@iprimus.com.au to your 'Safe Sender' list on your email.